Honeydew is a variety of muskmelon with a pale yellow waxy skin and crisp light green flesh. The thick, juicy flesh is eaten raw on its own or mixed with other fruit in salads. It can also be used to make drink. Round or slightly oval in shape, honeydew is a medium-sized melon, typically about 15-22 cm (5.9–8.7 in) long. Depending on its maturity, the smooth skin of a honeydew melon ranges from pale green to yellow. Its flesh is pale green, firm and juicy. At its center is a cluster of inedible seeds. Colors: Pale green to creamy yellow. Food complements: Cantaloupe, Watermelon, Strawberries, Grapes, Tangy cheeses. Wine complements: Chardonnay, Reisling, Sauvignon blanc, Sangria. Substitutes: Cranshaw melon, Persian melon, Casaba melon, Cantaloupe. Choosing: Choose a honeydew that is a creamy yellow color to ensure the most mature melon. The best will be nearly spherical in shape and should feel heavy for its size. Find a melon with the most pristine exterior possible, showing no obvious scars or defects. Buying: While honeydew is available year-round in typical grocery stores, it will be at its best in late summer and early fall. In certain growing regions, such as California, Arizona, or Texas, you can find honeydew at local farmers' markets once the melon is in season. Procuring: Honeydew may be easily grown in climates with warm, humid summers. They grow well in the same conditions cucumbers enjoy, which make them ideal crop mates. May be grown trailing over the ground or trained as climbers. If cultivated as a climber, however, the fruit must be independently supported once it has grown to a softball size to avoid breaking away from the vine. Feed with a tomato fertilizer. 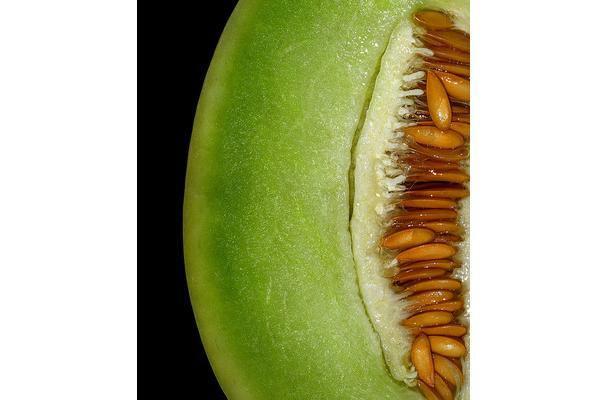 Split honeydew in half with a sturdy knife to reach and scoop out the seeds nestled in the center of the fruit. Then the honeydew may be sliced, cubed, or scooped out with a melon-baller, depending on preference. Its waxy skin is inedible and should be discarded. Honeydew is usually prepared as a dessert and served fresh. While delicious alone, it is excellent tossed into a fruit salad, added to fruit kabobs, or used as a garnish to beverages. Cleaning: Before cutting the honeydew, wash its exterior with water and a mild detergent to remove any pesticides or other contagions. Honeydew can be stored in a variety of ways, depending on its intended date of consumption. Left at room temperature, honeydew is generally best kept whole and prepared within two to four days, depending on its ripeness. Refrigerated, a whole honeydew may keep for five to seven days, whereas prepared honeydew should be eaten from one to three days. To freeze honeydew, the melon should be washed, seeded, peeled, and chopped to its desired size before sealing it in an airtight container. It will be at its best for ten to twelve months, but will keep indefinitely. History: The melon most likely originated in Asia around 2400 B.C., but didn't appear in Europe until the 15th or 16th century. Honeydew's particular origin is unclear, though the variety of its namesake, White Antibes, has long been cultivated in Southern France and Algeria. It became introduced to America from France in 1900, where it became a popular crop in warm climates.